A tried and trusted design, used as a staple item by Emergency Services and Rescue Organisations for many years. Its main function, apart from transporting the injured to safety, is to do so in such a way that protects the spine where an accident is suspected of causing damage. Scoop stretchers do what their name suggests. Instead of a flat, plain bed, the stretcher incorporates a frame of hinged panels. In their unlocked position, each panel is capable of being swivelled, (rather like a cellar trapdoor). 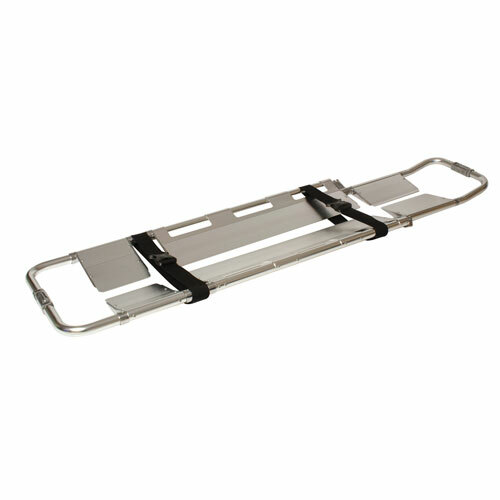 Without disturbance to the patient’s position, the stretcher can be manoeuvred in such a way that allows each of these panels or flaps to slide underneath the body. Once in its final position, all the plates are locked into place and the patient can be safely moved. Instead of being lifted onto a traditional stretcher, they have literally been ‘scooped’ up! One vital feature is the way the stretcher maximises patient immobilisation during transit. Such details can actually make the difference between recovery and permanent spinal damage. Another important feature of the Relequip Scoop is that when locked in place, the panels that form the bed leave a narrow gap that runs the full length of the stretcher. This allows Emergency Staff to carry out Spinal X-Ray without moving the patient.